BLOX Fuel Injector Accessories UNIVERSAL - Dezod Motorsports Inc - Home of the automotive performance enthusiast since 2002. BLOX Racing offers harnesses and quick connectors that make installing BLOX Racing and aftermarket fuel injectors quick and easy. 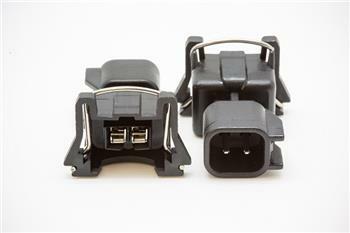 The wired harnesses (for OBD1 and OBD2) offer plug-and-play installation while the quick connectors feature a one-piece body and are specifically designed to fit specific male-female injector clips.